It is probably worth stating that the classification of any artist’s music into a single genre is fairly arbitrary and can differ between record company, music retailer and national trade association. Categorizing music within a genre can often have multiple influencing factors, such as musical technique, style, context, target audience and geographical origin. Moreover, many genres have subgenres that can overlap others. For example, media-management service Gracenote categorizes music into more than 1,600 individual genre categories. To confuse things even more, several studies have been published in recent years describing theoretical and scientific approaches to determining a music genre. However, for the purposes of this study, Music & Copyright has limited itself to the most commonly used genre categories by most national trade associations when presenting a breakdown of sales by genre. 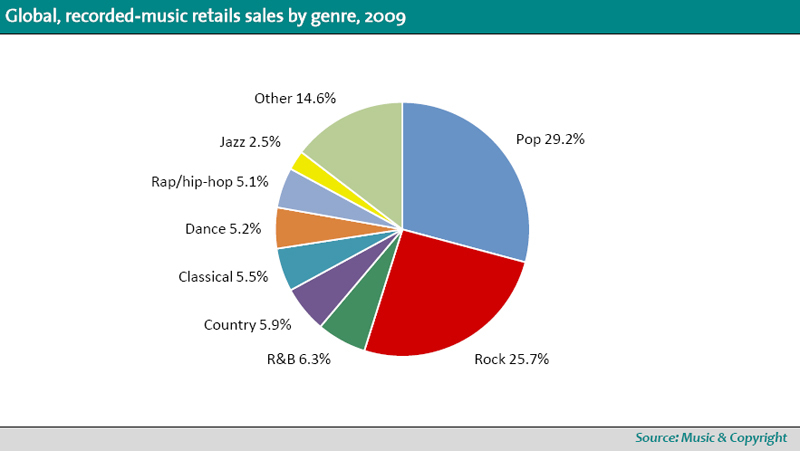 The two most popular music genres in terms of retail sales over the past 10 years are pop and rock. According to Music & Copyright, retail sales of pop music stood at US$7.4 billion in 2009, while retail sales of rock music stood at US$6.5 billion. In terms of revenue share, pop accounted for 29.2% of global music-retail sales last year, with rock taking a 25.7% share. The closeness of the two genres at the end of the last decade was also apparent at the beginning. In 2000, pop had a global sales share of 27.8%, with rock at 22.7%. Despite a difference in year-to-year share performance, the retail-sales decline of the two genres in the previous decade has been fairly even: For pop, retail sales decreased 27.7%, while retail sales for rock fell 22.1%. However, both genres outperformed total music-retail sales, which fell 31% in 2009, to US$25.4 billion, from US$36.9 billion in 2000. With pop and rock accounting for a combined retail-sales share of 55% in 2009, other genres have clearly underperformed when compared with the global sales decline. Music & Copyright has found that the retail value of rap/hip-hop sales dropped almost 50% between 2000 and 2009. It should be noted that the performance of particular genres of music that are more popular in some larger markets, such as the US and Japan, will also be reflected on a global level because of the high share of retail sales in those markets. However, rap/hip-hop has received criticism in recent years, particularly in the US, for its close association with violence. A poll a few years ago of black Americans conducted by the Associated Press and AOL-Black Voices found that half of all respondents described the genre as having a negative image. Retail sales of classical music and jazz have also experienced a faster decline than the global average. For these genres, as well as some other genres grouped in this study as part of “other,” the reduction in floor space by brick-and-mortar retailers of slow-selling, low-margin genres in favor of better-selling items, such as DVDs, video games and consumer electronics, has had an impact on availability and subsequently sales. Moreover, the transition to digital and away from physical soundcarriers could be having a negative effect on the retail sales of the more-niche genres. For example, classical music is available online, but this on its own is not enough to secure sales. Except for searches for specific titles, browsing for classical music can be more restrictive online than in a physical store, because a consumer can see only what is displayed on his monitor at any one time. If digital-music services do not have helpful links, charts, submenus and subgenres, freely browsing a genre without significant background knowledge is almost impossible. Although some genres that are more popular in a limited number of countries are included in this analysis, some are not. Country music, for example, is included, because it is more popular in the world’s biggest market, the US. The number of country-focused radio stations outnumbers most other genre-based stations. Because of this, a large number of country tracks figure in the Billboard Hot 100 singles chart, which is based on airplay rather than sales. However, in terms of retail sales, the genre accounts for about 12%, compared with more than 30% for rock. Even so, despite much-lower retail sales of country music elsewhere in the world, the high level in the US resulted in a global share of 5.9% in 2009. Previous Post GEMA’s voting structure comes under scrutiny, but is it any less democratic than other collection societies’ in Europe? Next Post Have the wheels come off the latest French revolution? Hmmm…I don’t see where rock, a genre where people play real musical instruments they have taken the time to learn how to play can be seen as overrated in comparison to modern pop music which is mostly electronic Disco played on synthesizers.and sequencers. Reblogged this on ART UNDERGROUND Blog.